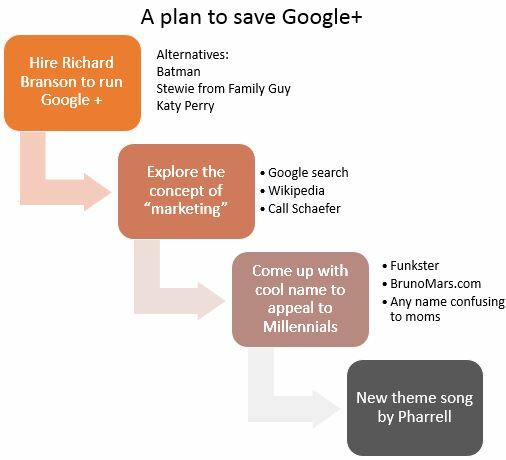 The Marketing Companion : Where do we go next with Google+ ? Where do we go next with Google+ ? Whether you think Google+ is dead, dying, or still on the rise, one thing is certain: something has to change. This post will tell you what and why. Google+ was meant to take on Facebook. This is an economic imperative for a company built on: a) collecting personal information that can be turned into ads and b) finding ways to have you spend more time on their sites so you can see those ads. Facebook was capturing a disproportionate share of our personal information and Google had to do something. Their aim was to build a better social network and expose all of Facebook's flaws. You could argue that it did that ... so why is Google+ in turmoil? (And it is). The reason Google+ has never gone mainstream is because the world does not want a better social network, It wants a COOLER social network and Google+ is not cool with the young people who could move it into the mainstream. It's not about tech. It's about cool. Facebook is vulnerable as Millenials move into other places like Snapchat, Twitter and Kik. Google is simply not on the radar screen of the folks who are going to determine the Next Big Thing. High school kids don't give a damn about better SEO results. They want to be cool. Instead of building engineeringly-beautiful new features and integrating with other Google products (who trusts that any way?) Google should hire Bruno Mars or Katy Perry to be the Google+ spokesperson and launch a massive media campaign to attract the hearts and minds of taste-makers under the age of 19. Marketing its products has always been a problem for Google and I think we're seeing this vulnerability in full view right now. There are a lot of aspects to this discussion beyond the Google+ cool factor (or lack of it) and that is the fodder for the conversation between Tom Webster and I on the latest Marketing Companion podcast. Do we really need to fix Google Plus ? If the numbers on Google+ up, why the organizational disharmony? Is Google+ going to be another "fast fail" or a lasting part of the company's strategy?